Animals living in volatile habitats can gain major evolutionary benefits by shielding their families from the changing environment, new research suggests. Biologists from the University of Bristol, the University of Exeter and UCL investigated an overlooked reason for widespread cooperation amongst animals. In a study published today in Nature, the team showed that when the environment is prone to fluctuate unexpectedly, staying at home to help raise relatives can be much better than going solo. Patrick Kennedy from the University of Bristol's School of Biological Sciences, who led the study, said: "In the last few years, biologists have noticed that high levels of animal cooperation are often found in very harsh and unpredictable places – from birds on African savannahs to bees in the Alps. We wanted to find out whether evolution might work differently in these changeable habitats. "Explaining the existence of sterile worker bees was a big problem for Charles Darwin. 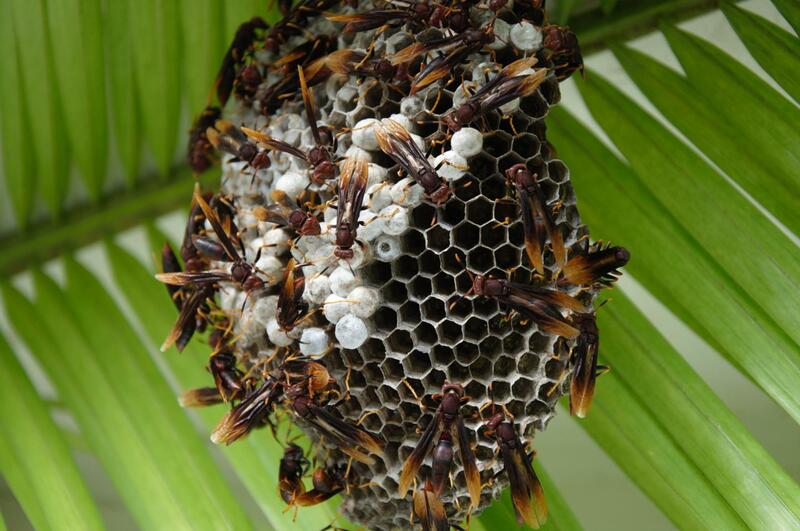 Why should any bee sacrifice the chance to reproduce in order to raise sisters or nieces? Scientists now understand that helping behaviour evolves because the helper is related to those she helps." Recently, however, this explanation for helping behaviour has been challenged. Co-author Professor Andy Radford, also from Bristol's School of Biological Sciences, added: "Often, when biologists have measured outcomes in the wild, either helpers weren't closely enough related, or they could have had their own offspring quite easily, or they didn't make much difference to the survival of their siblings." By including the turbulent nature of environments in the maths, the team showed that helping behaviour was in fact easier to evolve than previously thought: helpers don't need to be very closely related to those they help if the environment is highly unpredictable. Co-author Dr Seirian Sumner, who studies social insects, and is based at UCL's Department for Genetics, Evolution & Environment added: "We realised that help might actually only be of use if the year turns out to be difficult, such as bad weather or not enough food. Helping relatives in bad years can have a huge effect on the number of grandchildren if it means your family does much better than others when times are hard. So, it's worth siblings hedging their bets and staying at home." Patrick Kennedy added: "Getting the edge on your competitors when times are tough can make all the difference, even if it makes you less competitive in the good times. It's a bit like carrying a spare sail in a sailing race. When conditions are good, the extra weight will just slow you down. But if your sail gets shredded by a gale, you'll be able to hoist the new one whilst your competitors are stuck with broken sails. In the long run, being able to ride out the storm puts you in the lead." The results, say the research team, could have big implications for our understanding of how cooperation evolves in animals. The famous biologist JBS Haldane first saw the importance of shared genes: he remarked that he would lay down his life for two brothers but not one. As for all of us, Haldane shared half his genes with a brother, so it would only be worth sacrificing himself (from a genetic perspective) if he could save at least two brothers. Dr Andrew Higginson, another member of the team, based at Exeter University, explained: "Our findings mean that shared genes might actually explain helping in lots of cases that seemed to contradict the established theory. Many biologists may want to reassess whether their data actually support Haldane's idea after all."